Feedburner provides useful subscription stats and powerful overrides that any blogger or podcaster can use. 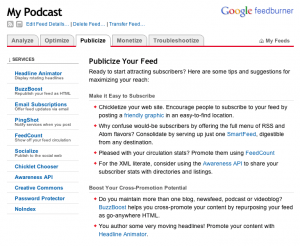 Learn how to setup Feedburner with your WordPress website for your blog or podcast. If you want your whole-site feed from WordPress, and you have permalinks enabled, then your RSS feed will probably be http://mypodcast.com/feed/. I don't suggest giving this to podcast directories. If you do, then your blog posts will push your podcast episodes out of the limited number of items your feed can hold (set in WordPress admin > Settings > Reading). There are two ways to get a podcast-only feed. Place all your podcast episodes in a special category (“Podcast”), then add “feed/” to that category's URL. This would most likely look like http://mypodcast.com/category/podcast/feed/. Use Blubrry PowerPress to generate a podcast-only feed (PowerPress > Settings > Feeds), which will most likely be http://mypodcast.com/feed/podcast/. I do recommend having separate RSS feeds: one for everything and one for just podcast episodes. 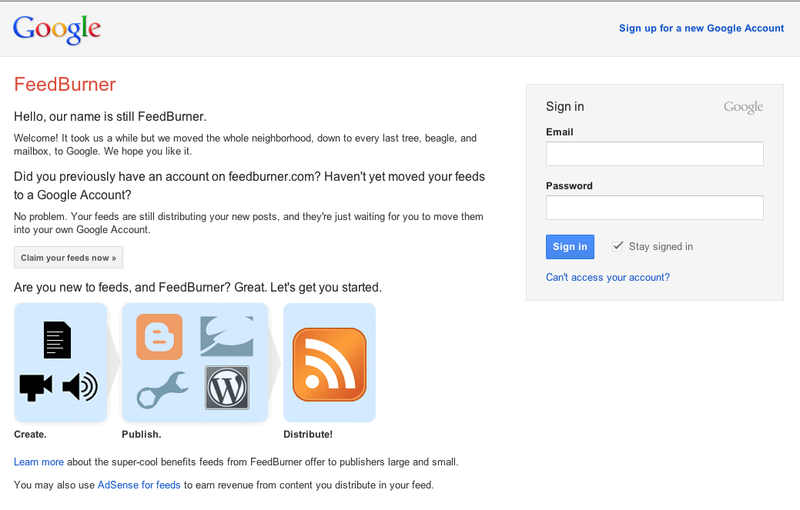 Visit Feedburner and login with your Google account. Once logged in, paste your original feed (chosen in step 1) into “Burn a feed right this instant.” Then click Next. If there's an error, it will warn you and you'll need to make sure you entered a real feed address. 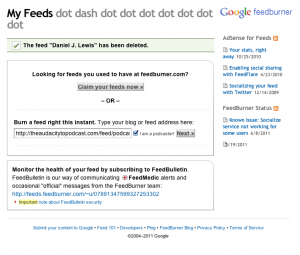 Next, you'll choose your URL for the feed, so it would look like http://feeds.feedburner.com/mypodcast. Feedburner's SmartCast options are great for turning a regular RSS feed into an iTunes-friendly podcast feed. However, everything in Feedburner's SmartCast page is also in Blubrry PowerPress's iTunes page (WordPress admin > PowerPress > Settings > iTunes). Chose whether you want to use iTunes or Blubrry to power this information. Whatever you decide, follow a few guidelines for these iTunes-only fields. Podcast image should be 600×600 (even though Feedburner recommends 300×300). This is separate from your RSS image if you enter something different here. The summary/description is what people read about your podcast in the iTunes podcast directory. Keywords help people find you. Enter words that describe the overall themes of your whole show, not just individual episodes. “Explicit” options. PowerPress explains this better than Feedburner. Originally, the “Clean” tag was supposed to mean explicit content that was cleaned. Feedburner still references it like this. However, people interpret the “Clean” tag to mean there wasn't anything “dirty” at all. If yours is a clean podcast, then use “Clean,” even if it means picking Feedburner's “Yes – cleaned.” If yours is an explicit podcast, then choose that tag appropriately. But if you're not curse-free but also not explicit (think of most TWiT podcasts), then leave it as “No” to display nothing. Yes, use Feedburner for stats! But you have to understand that it's only a daily report of how many people (or programs) checked your RSS feed on that day. Learn more about podcasting stats in episode 8. Now that we're done with the walkthrough setup, click the Optimize tab. We're only concerned with a few options. SmartCast for configuring your feed for iTunes. PowerPress also does this. Only applies to podcasters. FeedFlare gives RSS-readers some extra links at the end of each item, such as email, StumbleUpon, Delicious, and more. Only applies to bloggers. Feed Image Burner if you want to override the default RSS image. This image should be 144 x 144 pixels. Title/Description Burner will override your feed title. Use this when you want to get rid of “How to Be Awesome Podcast | My Totally Awesome Website” and make it simply “How to Be Awesome.” Also override your description here. After you've optimized, now it's time for the publishing options. Again, we only need certain options (and not necessarily all of the following). Email subscriptions gives you HTML code to paste on your site for visitor to subscribe to your RSS feed via email. This is very handy for people who don't know what RSS is. PingShot will tell certain websites that you have updated content. Socialize can tweet whenever you have new content in your RSS feed, just like TwitterFeed. Chicklet Chooser—please don't. This isn't the '90s. Awareness API—handy for a lot of tools to communicate with your Feedburner account. For example, a WordPress plugin to display your latest subscription numbers in your WordPress dashboard. Creative Commons is handy for bloggers to automatically remind readers that content is released under a Creative Commons license. Only applies to bloggers. Password Protector lets you lock your feed with a single username and password. This is not your options for a premium podcast. If you use Google AdSense on your website, you can earn extra money by enabling it in your RSS feed, too! Only applies to bloggers. If you're having trouble with your feed and things don't seem to be updating, try one of the two tools that Feedburner gives you. Resync—clears all cached content and grabs it all over again from the original feed. Now that you have your site's feed going into Feedburner, you need to redirect your site's current and future subscribes to your Feedburner address. You can do this with one of several WordPress options. Whatever method you choose or already have in place, you most likely just have to enable redirection and paste your Feedburner address into a field. This will then redirect all requests for your RSS feed to your Feedburner feed. 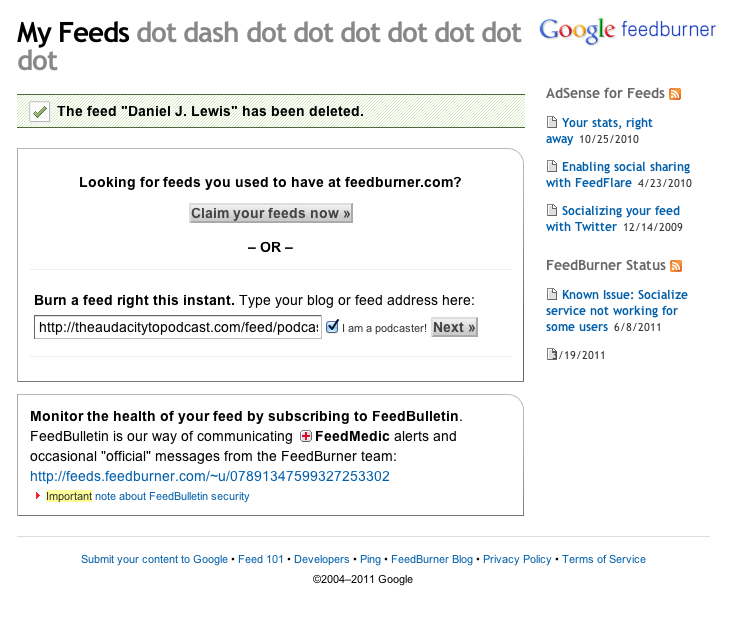 It does you no good to put your blog or podcast in Feedburner and not use it. Make sure you have the redirection working, and then use your Feedburner address everywhere! If it's a directory about blogs, or in any way that people will read your RSS updates, use your all-site main feed. If it's a podcast directory where only podcast episodes show and blog posts are hidden, use your podcast-only feed. 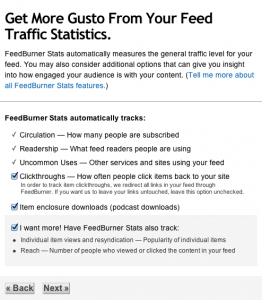 Feedburner stats are often criticized. 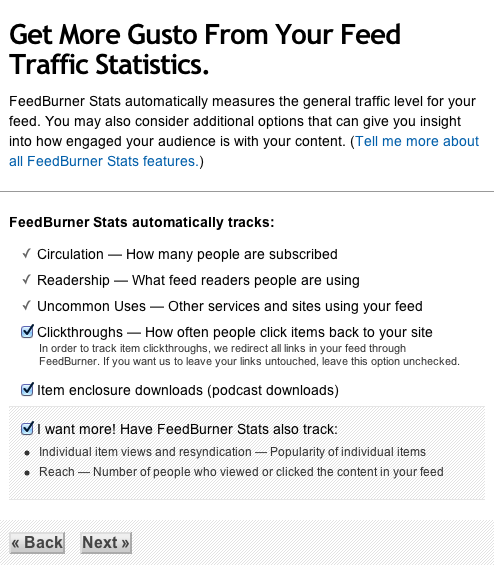 Don't look at Feedburner for your download stats, but do use it for subscriber stats. Imagine you have a podcast episode that gets downloaded 10,000 times in one day. Depending on your media host (or podcast stats system), you may not be able to tell whether those downloads came from subscriptions (“iTunes” in a list doesn't mean “iTunes subscribers”). But imagine that you check your RSS feeds and see only 100 subscribers. This would indicate that you were featured somewhere and people downloaded an episode or maybe clicked play on your website, but they didn't convert to subscribers. Thus, they will not automatically receive your new episodes. Use feedvaliditor.org to see if there are any errors in your feed that prevent it from being valid. If your feed isn't valid, iTunes won't accept it. Warnings are okay. Thanks, Kevin! I'm glad that it provided something useful to you. Just a quick question – I use Genesis too and have set up the feedburner feed for my whole of site feed. But my podcast is one category of my site… do I need to worry about setting up the Feedburner feed in WP? No, you don't need your podcast-only feed redirecting from your site like your whole-site feed is. Website visitors will never need your podcast-only feed as long as you're in the most-popular directories and you tell them to subscribe there. 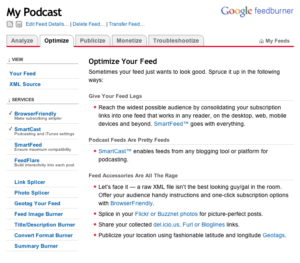 Instead, grab your category feed from yourpodcast.com/categoryname/feed/ and run that through Feedburner. 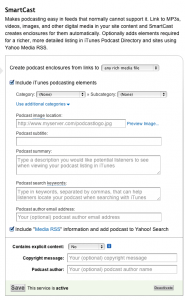 Then use that RSS address when submitting your podcast to directories like iTunes, Zune, and any others. Im using Blogger, Feedburner, iTunes. iTunes will only show the most recent 3 or 4 episodes. How to I change the settings so that iTunes will show all the episodes? Hi, Derek! Unless you’re overriding things with Feedburner, this item limit is set inside of Blogger. I’m not familiar with them to tell you where to go to change the setting, if you even can. Im using Blogger, and i cant creat categories. My Blog contains text-only posts, and the podcast posts. I want the only for the podcasts (only sound). How can I do it on blogger? Learn how to use Yahoo! Pipes to filter your RSS feed to just your podcast-episode posts. Then take the RSS feed that Yahoo! Pipes creates and run that back through FeedBurner. I installed the FD Feedburner plugin, but I’m not sure what to put in the “Redirect my feeds here” slot. I only “burned” my podcast only RSS feed, which is a category. Actually, you no longer need FeedBurner. If you’re using PowerPress, I recommend that you use its default feed, which would be /feed/podcast, instead of a category feed. Read and listen to my newer stuff on FeedBurner. You’ll hear its many shortcomings and problems it can sometimes create. I only recommend FeedBurner when you don’t own your platform, such as if you were hosting on PodBean, WordPress.com, Blogger, SquareSpace, SoundCloud, etc. Yup, I already switched over to PowerPress fully after having made it through more of your podcast. I appreciate the answer, though, as I do have another podcast running on podbean right now, so this’ll be helpful for that. I tried submitting my podcast (blogger+feedburner) to google (https://play.google.com/music/podcasts/publish?u=0#) and it’s giving me an error. Any ideas? The podcast RSS feed must have an author in the or tag. Learn More. Well, that’s what your RSS feed must have. What’s the feed URL you tried to submit? It sounds like it’s not a valid podcast feed. Looks like your feed is invalid and has several problems. It could be FeedBurner causing that, or whatever is the source feed going into FeedBurner. Would you like to know about my feed repair/optimization service? Hey, if i press ‘NEXT’ to submit a feed it says ‘The URL does not appear to reference a valid XML file. We encountered the following problem: Error on line 945: The element type “meta” must be terminated by the matching end-tag “”.’ What should i do ? Then you’re not giving FeedBurner a valid RSS feed. 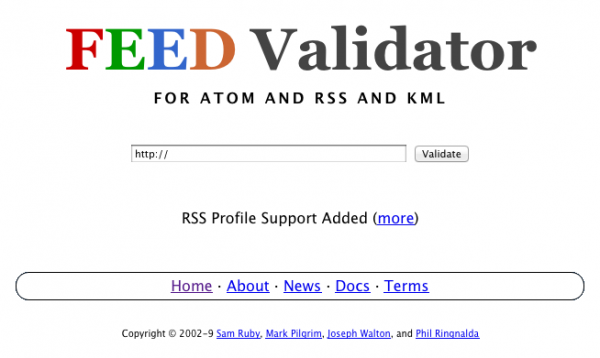 RSS is a particular style of XML data. Hi. I’m relatively new to podcasting and submitted my rss feed to Itunes prior to knowing about Feedburner. My Podcast is currently hosted on SoundCloud and there seems to be no easy way to redirect Itunes to Feedburner on SoundCloud’s end. Would you have any advice? Thanks, Amelia! Decent article, too! Is there a way to use one feed for blogger posts and podcast episodes (that are separate blogger posts? A Feedburner feed that has can bebsubmitted and has all the episodes only. But when used with a reader (Feedly) has the blog posts and episodes. I know I might be asking too much.